Want to serve as a member? We’re recruiting! If you are an undergraduate or graduate student who strives for academic excellence and wants to serve your community, Alpha Phi Sigma might be for you. In September, 1941, Dr. Vivian Anderson Leonard was asked by the president of Washington State University if he would accept the directorship of a Police Science Academic Program at Washington State. Dr. Leonard accepted the offer and became responsible for developing a four year curriculum which would lead to a Bachelor’s Degree in Police Administration. Upon his arrival at Washington State, Dr. Leonard began to realize how important it was that a Police Science Honorary be established. The purpose of this honorary would be to promote excellence in scholarship and performance. In January, 1942, Dr. Leonard met with seventeen Police Science majors at Washington state and Alpha Phi Sigma was established. Glenn Hill was elected as the first president and appointed a committee to draft the first Constitution and By-laws. During its initial years Alpha Phi Sigma experienced only limited growth, but on March 24, 1976 in Dallas, Texas, the Executive Board of the Academy of Criminal Justice Sciences voted unanimously to designate Alpha Phi Sigma as the National Criminal Justice Honor Society. At this time, Alpha Phi Sigma had only fourteen chapters; however, since then, Alpha Phi Sigma has continued to grow and prosper at a very rapid rate and there are now over three hundred and sixty Chapters. Over the years the National Officers have been located at Universities across the country, such as, Washington State University, Midwestern State University, Eastern Kentucky University, Texas Woman’s University, Fairmont State College, Marshall University, Tarleton State University, Florida International University, Boise State University, University of Houston ~ Downtown. 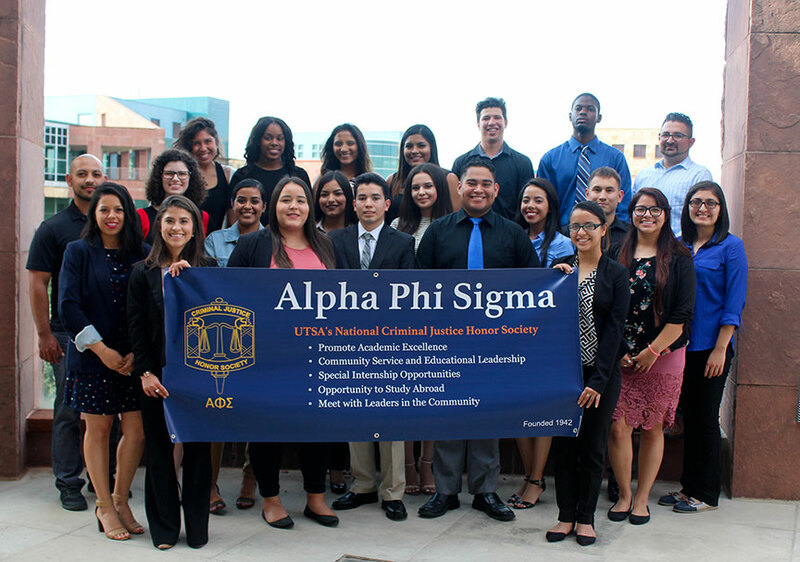 Alpha Phi Sigma is the nationally recognized honor society for students in the Criminal Justice sciences. The society recognizes academic excellence by undergraduates as well as graduates of Criminal Justice. To become a member, the student must have completed one-third of their total hours required for graduation at his/her institution. The student must be recommended, to Nationals, by the chapter advisor. Undergraduate students must maintain a minimum of 3.2 overall GPA on a 4.0 scale in Criminal Justice courses. The student must also rank in the top 35% of their classes and have completed a minimum of four courses within the Criminal Justice curriculum. The Honor Society is open to those with a declared Criminal Justice major or minor. Graduate students are required to maintain a minimum of a 3.4 GPA in both Criminal Justice courses and overall courses, on a 4.0 scale. Student must have completed a minimum of four courses within the Criminal Justice curriculum. Law students enrolled in law school, having completed one academic year, with a grade point average of 2.5 or higher, on a 4.0 scale. Alpha Phi Sigma brought joy and comfort to families in need during the Thanksgiving holiday. 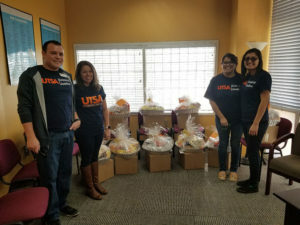 They created baskets filled with turkeys and delivered them to Family Services Association to help individuals who may not have been able to afford a Thanksgiving meal. Alpha Phi Sigma (APS), the National Criminal Justice Honor Society, organized a donation drive for those impacted by Hurricane Harvey. Many residents near the gulf coast regions of Texas in Rockport, Victoria, Houston, and other communities lost their homes, livelihood, and personal possessions. Thousands were displaced to various shelters with little food, water, clothing, etc. Thanks to the help of organizations and people across the country, donations of basic necessities were delivered to local shelters for survivors of Harvey. 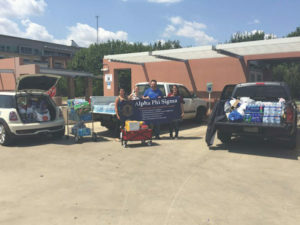 Alpha Phi Sigma kept the momentum going by asking for items from students, faculty, and staff within the College of Public Policy; the community; and UTSA to help with the relief efforts. In a period of three days APS collected over 1,837 pounds of non perishable food items, over 174 pounds of hygiene products and over 146 pounds of bottled water. APS members also contributed over 60 volunteer hours assisting The San Antonio Food Bank in the collection and distribution of food items. Alpha Phi Sigma UTSA Chapter Organization donated $200.00 towards the Hurricane Harvey Relief Fund. Lecturer Henry Meade, advisor to Alpha Phi Sigma, thanks everyone in COPP, UTSA, and the criminal justice community. Check out what our alumni are doing now!